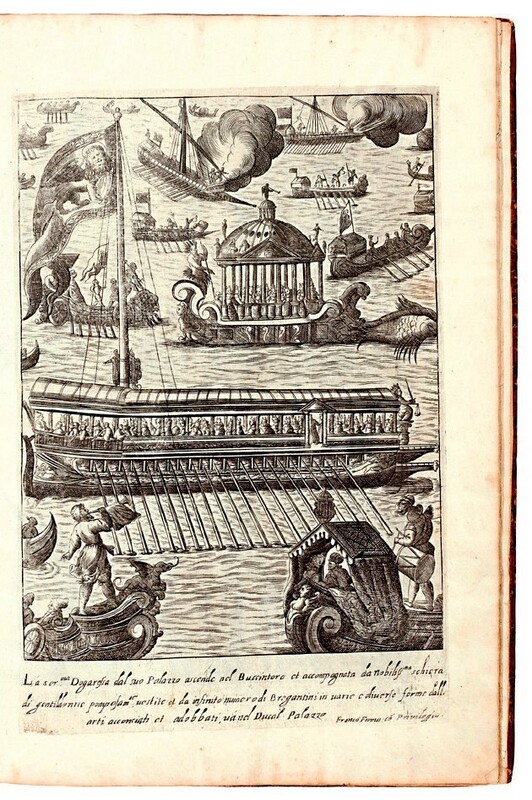 Copies of Giacomo Franco’s Habiti d’huomeni et donne venetiane…, a collection of detailed views and scenes of Venetian life and costume published c.1610, vary in the numbers of plates they present. Aquatic pageantry in one of the Venetian ceremonial plates from Habiti d’huomeni et donne venetiane…, sold at £38,000. Running to 31 engraved plates and formerly in the library of the celebrated bibliographer of hunting and hawking, CFGR Schwerdt, a copy sold in 1939 for £7.10s made £38,000 when it found its way back to Sotheby’s (25/20/12.9%) on December 4. Another bibliographer once suggested that this copy might be a later edition, but the selling price more than doubled that previously seen at auction for any edition.